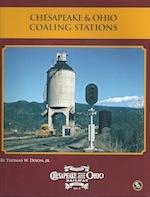 This book is an overview tretment of coaling station facilities on the C&O. It gives background about these facilities and how they operated, then shows the two major styles used by the C&O: cylindrical and box or rectangular, as well as some odd styles the company installed. It should be particularly interesting for modelers and some drawings used in erection of these structures in the 1915-1930 are included.